A stroke can effect individuals differently, depending on which part of the brain is effected, and how long it was deprived of oxygen. Long term challenges can occur causing physical, communication, emotional and behavioral changes. If you are struggling with the debilitating after effects of a stroke that require long term assisted living, we are here to help. A stroke can be described as a brain attack. A stroke occurs when a blood vessel, which is carrying oxygen and nutrients to the brain, bursts or is blocked by a clot. Impact varies depending on the extent of the brain injury, and speed of getting treatment. Recovery is different for each person. Some people may recover and have only a slight disability. Other people may have more serious disabilities. Most stroke survivors experience some change or disability after suffering a stroke. 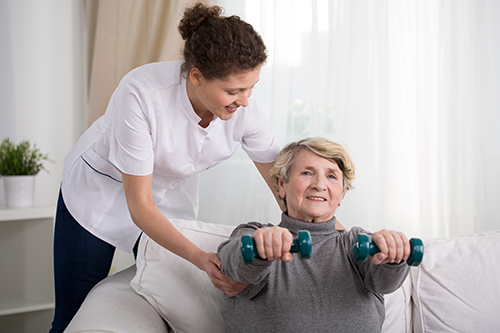 We are fully equipped to handle the assisted living needs of persons of a wide range of ages, afflictions, conditions, and disabilities — including stroke. We strive to make each day meaningful. We work closely with doctors and physical therapist’s, following instructions for exercises that will facilitate the client’s rehabilitation. We also work to support rehabilitation by serving healthy foods and freshly juiced juices, assisting and/or supporting efforts to engage in other appropriate physical activity and otherwise aid in efforts to prevent any more strokes. Take control of your health today and learn more about stroke. National Stroke Association offers a variety of helpful information and covers a wide range of topics to address your concerns and keep you informed.